Integrating demography and adaptive evolution is pivotal to understanding the evolutionary history and conservation of great apes. However, little is known about the adaptive evolution of our closest relatives, in particular if and to what extent adaptions to environmental differences have occurred. Here, we used whole-genome sequencing data from critically endangered orangutans from North Sumatra (Pongo abelii) and Borneo (P. pygmaeus) to investigate adaptive responses of each species to environmental differences during the Pleistocene. Taking into account the markedly disparate demographic histories of each species after their split ~ 1 Ma ago, we show that persistent environmental differences on each island had a strong impact on the adaptive evolution of the genus Pongo. Across a range of tests for positive selection, we find a consistent pattern of between-island and species differences. In the more productive Sumatran environment, the most notable signals of positive selection involve genes linked to brain and neuronal development, learning, and glucose metabolism. On Borneo, however, positive selection comprised genes involved in lipid metabolism, as well as cardiac and muscle activities. We find strikingly different sets of genes appearing to have evolved under strong positive selection in each species. In Sumatran orangutans, selection patterns were congruent with well-documented cognitive and behavioral differences between the species, such as a larger and more complex cultural repertoire and higher degrees of sociality. However, in Bornean orangutans, selective responses to fluctuating environmental conditions appear to have produced physiological adaptations to generally lower and temporally more unpredictable food supplies. Local adaptations are expected when species colonize novel environments, or within the context of heterogeneous environments and population structure . In humans, paleoclimatic changes may have triggered the expansion out of Africa into novel environments (e.g., [2, 3]). These migrations through the Late Pleistocene and the Neolithic exposed our ancestors to novel selective pressures, leading to numerous local adaptations (reviewed in ). Examples for such adaptations are thermoregulation  and lighter skin pigmentation in response to living at higher latitudes [6, 7], tolerance to hypoxia in higher altitudes [8–10], and complex traits like body size . In the Neolithic, with the switch to agricultural subsistence, cattle-breeding, higher population densities, and increased infectious-disease loads lead to changes in phenotypes linked to immune responses [12–14]. Compared to humans, however, little is known about the adaptive evolution in non-human great apes [15–18] and whether or to what extent adaptations to environmental changes have occurred. Identifying genetic signatures of adaptive evolution in our closest relatives will not only enhance our understanding of how adaptation has shaped genetic variation in extant great ape populations, but may also help us to understand the differences between human and non-human great apes. Orangutans (genus: Pongo) are the only great apes in Asia and phylogenetically the most distantly related to humans. Once widely distributed throughout Southeast Asia , their range is currently restricted to increasingly isolated forest patches on northern Sumatra (P. abelii and P. tapanuliensis) and Borneo (P. pygmaeus) (Fig. 1) . During most of the Pleistocene, orangutans on the two islands have been subjected to markedly different environmental conditions. On northern Sumatra, where all extant Sumatran orangutans occur, habitat conditions have been generally more stable and productive due to volcanism-enriched soils, lower levels of cloud cover, and more regular precipitation patterns [21, 22]. On Borneo, however, fluctuations of rainforest coverage during glacial cycles were more pronounced [23, 24]. Furthermore, particularly in the northeastern part of Borneo, orangutans (P. p. morio) have been exposed to marked temporal fluctuations in fruit availability, including mast fruiting events with short periods of overabundance of fruit, followed by extended periods of low fruit production [22, 25–27]. Moreover, severe and unpredictable droughts and forest fires due to El Niño events have been causing prolonged periods of extreme food scarcity, posing major threats to orangutan survival in this region [28, 29]. As a consequence of these differences in forest productivity and temporal stability of food supply, population densities are generally higher on northern Sumatra compared to Borneo and particularly low in the northeast of Borneo [30, 31]. In line with these long-term environmental differences, orangutans on Borneo and Sumatra show well-documented geographic variation in their biology, including morphology, physiology, life history, and cultural repertoire . Orangutans therefore provide a unique opportunity to investigate the interplay between environmental processes, demography, and adaptive evolution in two closely related, yet phenotypically distinct great ape species. To identify molecular targets of adaptive evolution, we used data from 35 complete orangutan genomes from nine geographically distinct sampling areas (Fig. 1) across the range of Bornean (P. pygmaeus) and North Sumatran (P. abelii) orangutans. We did not include the recently described Tapanuli orangutan (P. tapanuliensis) , as the low sample size (n = 2) of available genomes impeded such analyses. We carried out multiple tests to detect different molecular patterns associated with positive selection, such as distortion of the site-frequency spectrum [34, 35], extended haplotype structure [36, 37], and substitution patterns in coding regions [38, 39]. Detecting signatures of past and ongoing selective processes on the background of complex demographic histories is challenging [40, 41], as population size changes and structure can produce patterns similar to the ones expected under non-neutral scenarios . To avoid the detection of spurious signatures of selection, reliable identification of the targets of selection requires detailed knowledge about the demographic history . We therefore used a detailed demographic model  to account for outliers in genome scans caused by neutral demographic processes. We investigated the demographic history of the Bornean and Sumatran orangutan populations using the pairwise sequentially Markovian coalescent (PSMC)  and multiple sequentially Markovian coalescent (MSMC2)  methods. While PSMC (no phasing required) infers variation in effective population size (Ne) over time based on single diploid genomes, MSMC2 (phasing required) can additionally infer temporal patterns of gene flow by comparing haplotype pairs across populations. However, inaccurate phasing of autosomal data will break up long haplotype segments, biasing split time estimates and masking signatures of recent gene flow . We aimed to avoid such issues by focusing on male haploid X chromosomes. Our analyses suggested that the ancestors of Bornean and Sumatran orangutans began to diverge ~ 1 Ma (Fig. 2), and that gene flow between the diverged populations ceased between 1 Ma and 400 ka (Fig. 3a), with no evidence of subsequent gene flow. However, as X chromosomes in great apes have been found to be affected by widespread selection [46, 47], potential biases in coalescent-based estimates of Ne could arise using this approach. We therefore repeated the gene flow analyses using entire phased autosomal genomes, resulting in highly congruent estimates of the divergence time between orangutan species (Additional file 1: Figure S7A). To further corroborate the gene flow estimates and assess the impact of population structure on the PSMC and MSMC2 analyses, we fitted a demographic model to the empirical multi-dimensional site-frequency spectrum using the program momi2  (Additional file 1: Figure S8). Most parameter estimates were consistent with the findings from PSMC and MSMC2 (Additional file 1: Table S4). We obtained a split time between Borneo and Sumatra of ~ 731 ka (95% CI 716–741 ka), which falls right into the time window when the cross-population Ne estimates from MSMC2 increased towards infinity (Additional file 1: Figure S7A). However, while there was no indication of gene flow between Sumatra and Borneo more recent than ~ 400 ka in the MSMC2 analysis, our momi2 analysis suggested a more recent phase of admixture during the last glacial period (~ 44 ka, 40–48 ka). This admixture pulse was asymmetrical, with ~ 4.2% (4.0–4.4%) of Sumatran lineages being derived from Borneo while only ~ 1.5% (1.3–1.7%) of the Bornean lineages exhibit recent Sumatran ancestry. After their initial separation in the Middle Pleistocene, orangutan populations on Borneo and Sumatra exhibited strongly divergent demographic trajectories (Fig. 2). 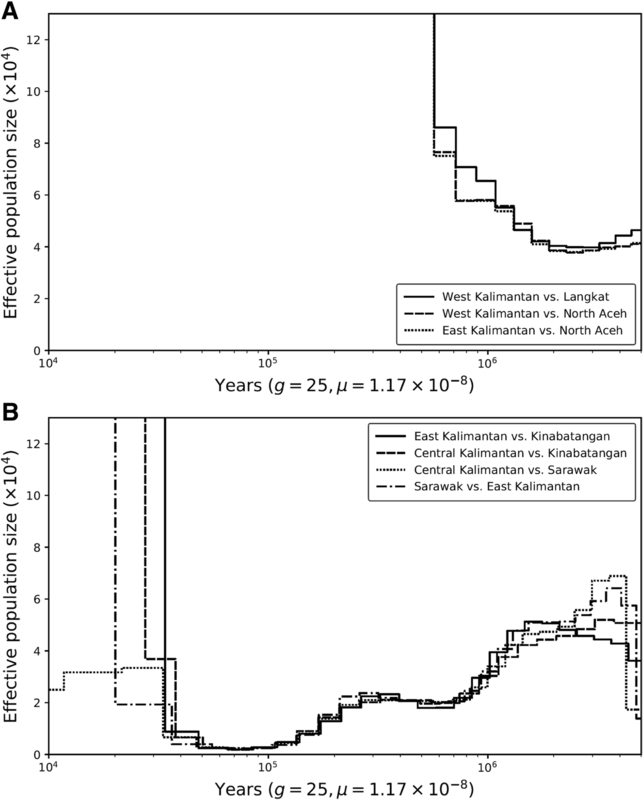 While Sumatran orangutans went through a continuous increase in Ne until ~ 70 ka ago, Borneans experienced a steady decline in Ne. The Ne of Bornean orangutans was reduced from ~ 30,000 to ~ 5000 between 300 and 100 ka ago (Fig. 2). Low cross-population Ne estimates of below 5000 for all population comparisons on Borneo at this time (Fig. 3b) indicate high levels of gene flow among Bornean populations and suggest the possibility of a single common refugium during this period. This was followed by a rapid increase of cross-population Ne at 20–50 ka, indicating increasing genetic isolation of most populations during the late Pleistocene (Fig. 3b). This result is in good agreement with the momi2 analysis, indicating a split time among Bornean population of ~ 25 ka (23–27 ka; Additional file 1: Table S4). However, the increase in cross-population Ne was not accompanied by an increase of Ne within populations, which remained low on Borneo (3000–10,000; Fig. 2, Additional file 1: Table S4). In contrast, on Sumatra, high Ne during the Middle Pleistocene ended with a rapid decline of about an order of magnitude at ~ 70–80 ka (Fig. 2). Similar to the pattern in Borneo, Ne in Sumatran orangutans did not recover (Fig. 2) and the site-frequency spectrum-based demographic model resulted in current Ne estimates as low as 80–230 for the populations on Sumatra (Additional file 1: Table S4). The divergent demographic histories of the orangutans on Borneo and Sumatra, along with persistent environmental differences on both islands [21, 23, 24], may have had a strong impact on adaptive evolution of this genus, since the efficiency of selection and the adaptive potential depend on Ne . Considering this, we explored potential genomic adaptions over different evolutionary time scales. We detected selection over more distant evolutionary time scales based on non-synonymous to synonymous substitution rate ratios within protein-coding genes estimated by Markov codon models (MCM; Additional file 1: SI Section 7). In this highly conservative approach, we applied the branch-site tests for positive selection by Zhang et al. on a set of 34,379 aligned exons of four primate species based on the reference sequences of human, chimpanzee, and rhesus macaque, along with the orangutan samples. We used samples from North Sumatran orangutans (P. abelii, LK/NA and WA), and Northeast Bornean orangutans (P. pygmaeus morio, populations SK/NK and EK), ignoring the recently established population structure (Additional file 1: Figure S8). Our MCM tests revealed 46 genes with evidence of positive selection in the Northeast Bornean branch and 33 genes in the North Sumatran branch (Additional file 1: Tables S6 and S7). To gain a better understanding of the functions of these genes, we generated interaction networks, where the nodes (genes) were colored based on functional classes according to the presence of specific keywords (Additional file 1: Table S9) in the GeneCards encyclopedia  (Fig. 4). The two resulting networks revealed that the functions of the candidate genes differed markedly between the two islands. Most of the genes under positive selection in Northeast Bornean orangutans were involved either in muscle and cardiac activities, in reproductive pathways, or in the lipid metabolism (Fig. 4a). In line with this observation, gene ontology (GO) enrichment analysis identified 11 GO terms that were significantly enriched for the candidate genes (Table 1), including multiple GO terms involved in fatty acid metabolism and muscle activities, one GO term involved in endocardial cell development, and another in the regulation of fertilization. 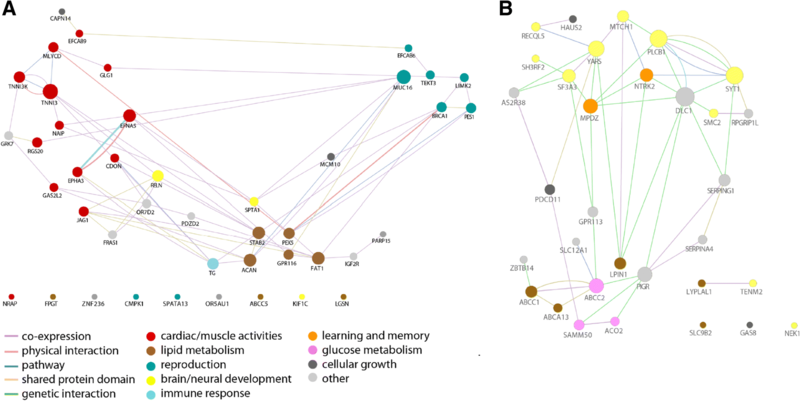 In North Sumatran orangutans, a striking number of positively selected genes were associated with brain and nervous system development as well as energy metabolism pathways (Fig. 4b). Gene ontology enrichment analyses of the these genes (Table 1) revealed a significant enrichment of GO terms related to ATP metabolism, cerebral cortex development, and two GO terms involved in brain-derived neurotrophic factor binding, all of which mediate higher cognitive abilities . To uncover signatures of more recent or ongoing local adaptations, we applied two complementary methods for detecting selective sweeps on the population level (Additional file 1: SI Section 9): (1) haplotype-based statistics (iHS) in windowed whole-genome scans , and (2) composite likelihood ratio (CLR) test implemented in SweeD . We split our dataset to account for current population structure , subdividing Sumatran samples into the two clusters Northeast Alas (LK/NA) and West Alas (WA), and the Bornean samples into the clusters Northeast Borneo (SK/NK and EK) and Central/West Kalimantan (CK/WK). In order to assess thresholds of significance and minimize the occurrence of false positives due to confounding effects of demography , we performed a set of neutral simulations based on a complex demographic model estimated through ABC modeling  (Additional file 1: SI Section 9.4). We then used GO enrichment analyses to unravel differences in biological functions of genes found to be under positive selection. We identified 961 annotated protein-coding genes within genomic candidate regions of positive selection (North Sumatran orangutans: n = 605, Bornean orangutans: n = 410, both: n = 54; Additional file 1: Table S11). Detailed information on all candidate genes, including summaries of their potential function and disease associations in humans and other animals, are provided in Additional file 2: Table S17. In Bornean orangutans, many candidate genes were associated with lipid and glucose metabolism as well as insulin and cholesterol regulation (Additional file 2: Table S18). After correction for multiple testing, GO enrichment analysis revealed one significantly enriched GO term within the Northeast Bornean orangutans which was related to immune system-related cell signaling (Table 2, Additional file 2: Tables S20 and S21). In North Sumatran orangutans, a striking number of positively selected genes were associated with crucial functions in learning and memory (Additional file 2: Table S19). In line with this, GO analyses showed a significant enrichment of terms related to neurological processes, synaptic transmission, learning, adult behavior, and cerebral cortex development (Table 1, Additional file 2: Tables S22 and S23). We identified 1027 protein-coding genes within genomic candidate regions of positive selection (North Sumatran orangutans: n = 658, Bornean orangutans: n = 489, both: n = 120; Additional file 1: Table S12). After correction for multiple testing, GO enrichment analysis revealed eight significantly enriched GO terms within the Sumatran West Alas population (Table 3). No other orangutan population showed significantly enriched GO terms after correction for multiple testing (Additional file 2: Tables S23–27). Among the significantly enriched GO terms in the West Alas population were such involved in glutamate receptor signaling, regulation of postsynaptic membrane potential, and cell projection organization. Glutamate receptors mediate postsynaptic excitation of neuronal cells and are important for neural communication, memory, and learning . Our demographic analyses highlighted the deep divergence of orangutans inhabiting the Southeast Asian islands of Sumatra and Borneo. Despite land bridges occurring between these islands as recently as ~ 10 ka ago , we found no evidence of substantial gene flow more recently than 500 ka in our gene flow analyses using either haploid male X chromosomes or entire phased autosomal genomes. This finding is also supported by deep divergence of island-specific mitochondrial haplotypes, even though Y-chromosomal data indicate the presence of low levels of gene flow during the Middle Pleistocene . In contrast, fitting a detailed demographic model to our genome-wide SNP data set, we found evidence for more recent admixture at ~ 44 ka. This recent admixture event falls into the last glacial period (115–12 ka), when sea levels were up to 120 m below the current sea level and the exposed Sunda shelf opened up land bridges in between the islands . However, this recent admixture appears to have affected only small fractions of individual genomes, which might explain why we did not detect it as a drop in cross-population Ne in the MSMC2 analysis. A more pervasive genetic exchange over the exposed Sunda shelf might have been prevented by the increasingly drier and seasonal climate of Late Pleistocene glacial periods . A savannah corridor , large river systems dissecting the exposed shelf , or most likely both might have imposed impassable dispersal barriers for orangutans. This early separation of gene pools had put Sumatran and Bornean orangutans on largely independent evolutionary trajectories, which is apparent from their divergent demographic histories. Most strikingly, while Sumatran orangutans appear to have expanded considerably in Ne during the Middle Pleistocene, Bornean orangutans experienced a pronounced decline in Ne following their isolation from the ancestral population. The Early–Middle Pleistocene transition 1.2–0.5 Ma was characterized by a fundamental change in the Earth’s climate , resulting in harsher glacial periods, affecting vegetation patterns in the tropics . In Sundaland, the drier and more seasonal climate during glacial periods seems to have severely impacted Bornean orangutans, probably through contraction of rainforest coverage [24, 58]. Furthermore, El Niño events have likely caused prolonged lean periods in the eastern parts of Borneo [28, 29]. On Sumatra, however, substantial areas are thought to have remained forested during glacial periods, probably facilitated by sustained high levels of precipitation due to convergent rainfall along the Barisan Mountain range , which runs along the western side of the entire island. Moreover, the younger geological age of Sumatra compared to Borneo as well as the mineral-rich volcanic soil resulted in higher rainforest productivity [21, 22], potentially alleviating negative impacts of glacial cycles on Sumatran orangutans. The decline of Bornean orangutans culminated in a very small Ne during the last glacial period. The combination of small Ne within populations and high levels of genetic exchange among populations is suggestive of a single refugium on Borneo, possibly linked to a severe contraction of rain forests during the last glacial period [23, 24]. The finding of strong gene flow between Bornean populations until less than 50 ka suggests that the genetic differentiation underlying the phenotypic differences between orangutan populations from central and northeast Borneo have emerged only recently. In contrast to the long-term negative population dynamics on Borneo, Sumatran orangutans retained a large Ne until 70–80 ka, when they experienced a severe reduction in Ne. It is notable that this sudden signal coincides with the Toba supereruption ~ 73 ka . The effects of this eruption, however, were probably limited in their geographic extent and likely of relatively short duration , as the mineral-rich deposits of Toba provided fertile ground for recovery of the highly productive Sumatran rainforests . Nevertheless, as on Borneo, Ne did not recover in Sumatran orangutans. It is possible that this reflects hunting by early human colonizers, who expanded rapidly into insular Southeast Asia in the Late Pleistocene ; however, other environmental factors may also have been responsible. The divergent demographic trajectories of orangutans on Borneo and Sumatra, together with persistent environmental differences until the present , may have had an important impact on adaptive evolution of this genus, and hence on the biology of these two species . Across a range of selection tests, we found a consistent pattern of between-island (and thus between-species) differences. In line with environmental constraints on Borneo and frequent episodes of extreme food scarcity , selection in Bornean orangutans appears to have manifested itself predominantly in physiological adaptations to the harsher environmental conditions on the island. P. p. morio showed an enrichment of genes under positive selection involved in cardiac activity, whose remodeling is known to enhance efficient usage of restricted energy resources . Adaptive changes in cardiovascular activities have also been shown for others in extreme environments such as for humans in oxygen-deprived high altitudes (reviewed in ), polar bears in cold waters , and lizards facing seasonal starvation . We also found an enrichment of genes under positive selection involved in lipid metabolism and energy storage. Such metabolic changes might allow for physiological buffering against starvation [25, 28, 66, 67]. This idea is supported by studies of physiology in wild orangutans and observations from captive animals, indicating that Bornean orangutans are better at storing fat in adipose depots than Sumatran orangutans [26, 28, 68]. It is worthwhile to note that in human populations inhabiting tropical rainforest and thus facing limitation and instability in their food supply, genes involved in lipid metabolism and muscle function were also found to be under selection . In contrast to Bornean orangutans, energy budgets of their North Sumatran counterparts are more favorable due to generally higher and more stable food supplies . In agreement with this, and the documented differences in phenotypic traits, we identified a very different set of candidate genes under positive selection, which were mostly linked to the brain and nervous system development, learning and memory processes, and glucose metabolism. It is conceivable that these selective changes have contributed to the development of extended behavioral plasticity via individual and social learning in North Sumatran orangutans, who surpass their Bornean counterparts in the size and complexity of cultural repertoire [32, 70, 71] and the ability to solve cognitive problems . Among the most striking examples of the broad phenotypic variation in the genus Pongo are the higher sociability and social tolerance of the North Sumatran orangutans [73–77]. Current population densities are higher on northern Sumatra than on Borneo , a situation which may have existed throughout most of the Pleistocene, given the higher estimates of historical Ne in P. abelii. Such higher densities may have provided more opportunities for social learning in North Sumatran orangutans, which in conjunction with selection on genes underlying cognitive abilities and prosocial behavior then facilitated the emergence and persistence of larger cultural repertoires compared to their Bornean counterparts. While not empirically evident, our results nevertheless suggest an intriguing link between the demographic history during the Pleistocene glaciations and the cognitive and cultural evolution in orangutans. Our sample set included whole-genome data from 35 orangutans, representing the entire geographic range of Bornean and North Sumatran orangutans (Additional file 1: Figure S1, Additional file 1: Table S1). All individuals were wild-born, except for five orangutans which were first-generation offspring of wild-born parents of the same species (Additional file 1: Table S2). We obtained whole-genome sequencing data for the study individuals from three different sources (Additional file 1: Tables S1 and S2): (i) Nater et al. (n = 16, effective quality-filtered sequencing coverage: 13.7–31.1x), (ii) Prado-Martinez et al. (n = 10, 20.5–27.4x), and (iii) Locke et al. (n = 9, 4.8–12.2x). We followed identical bioinformatics procedures for all 35 study individuals. Read mapping and variant calling is described in Nater et al. and briefly summarized in Additional file 1: SI Section 2. We phased genotype data from P. abelii and P. pygmaeus employing SHAPEIT v2.0 . We used a stringent high-quality subset of genotype data from the original SNP-calling dataset for each species, for which we extracted only biallelic and polymorphic SNPs without missing genotype data. We ran the algorithm at chromosome level to generate a haplotype graph, which we used to assess phasing uncertainty and to extract the most likely haplotypes per individual. We visualized the genetic relationships among the whole-genome sequences by building a neighbor-net using SplitsTree v4.14.6 . To obtain the underlying distance matrix, we calculated pairwise identity-by-state proportions with PLINK v1.90  using only biallelic SNPs with no missing genotypes across all 35 individuals. We inferred orangutan population size history with the pairwise sequentially Markovian coalescent (PSMC) model . PSMC is implemented as a hidden Markov model and allows inferring historical changes in Ne using the distribution of pairwise coalescent times within a single diploid genome. We applied the PSMC model to each sample, grouping individuals by sequencing coverage to avoid coverage-related biases (Fig. 2a, Additional file 1: Figures S1-S3). We ran PSMC with the parameter settings that were found to be suitable for great apes and have been applied to orangutans previously [43, 78]. We scaled the resulting plots using an autosomal mutation rate of 1.5 × 10−8 mutations per base pair per generation and a generation time of 25 years . We inferred ancestral gene flow between islands and between populations within islands using the multiple sequentially Markovian coalescent (MSMC2) model . Whereas PSMC uses information from inter-chromosomal genetic differences within a single diploid genome to infer ancestral Ne, MSMC2 extends this approach to multiple haplotypes from different populations. Since the model requires phased data to pair haploid genome sequences across populations, high phasing accuracy is paramount. To avoid issues with phasing uncertainty, we focused solely on male X chromosomes. We scaled the results using an X-chromosomal mutation rate of 1.17 × 10−8 mutations per base pair per generation and a generation time of 25 years . To identify protein-coding genes under positive selection, we used likelihood ratio tests (LRTs) based on pairs of nested Markov models of codon substitutions as implemented in PAML v1.3.1 . Selection on the protein level was measured by the ω-ratio of non-synonymous to synonymous substitution rates , where higher ω-ratio indicates recurrent positive selection. We used a single consensus FASTA genome sequence with randomly resolved haplotype phase for each individual. We identified the genomic positions of exons by retrieving a list of all unique protein-coding exons with Ensembl transcript IDs for the orangutan reference genome ponAbe2 from the UCSC Table Browser , only considering exons that (i) were at least 60 nucleotides long, (ii) had a number of nucleotides with multiples of 3, and (iii) contained at least one non-synonymous substitution in one of the individuals. As outgroups, we used human (hg18), chimpanzee (panTro4), and rhesus macaque (rheMac3) reference genomes from the UCSC Genome Browser . Multiple sequence alignments for each exon were constructed using the multiple alignment format files from the UCSC Genome Browser, applying AlignIO and MafIO tools of Biopython v1.60+  with default parameters. Gene trees were inferred separately for each protein-coding exon based on codon model M0 with one ω-ratio per gene as implemented in CodonPhyML v1.0. using the initial species topology in Additional file 1: Figure S14. 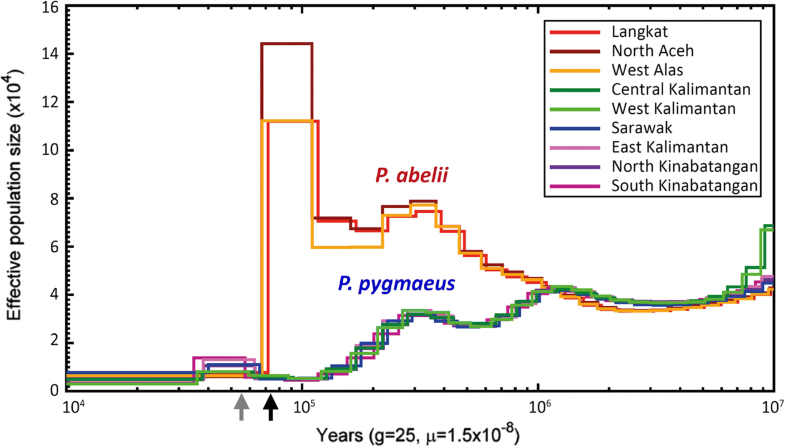 We applied a test for variability of ω among sites (comparing models M0 vs. M3). For exons with significant variation of ω in their sequences, we fitted the nested site models (M8 vs. M8a) to identify exons with evidence for positive selection. For this subset of exons, we then performed a LRT for positive selection based on branch-site models, where we compared the modified model A to the corresponding null model with ω fixed to 1 at the “foreground” branches. Here, we defined either the North Sumatran or the Northeast Bornean (all P. pygmaeus morio individuals) lineages as foreground. To uncover signatures of recent or ongoing selective sweeps, we applied two complementary tests of selection in genome-wide windows: (1) a haplotype-based selection test to identify extended linkage disequilibrium patterns surrounding recently selected alleles (iHS) [36, 37] and (2) a composite likelihood ratio (CLR) test to detect shifts in local site-frequency spectra relative to the genomic background. We used the R package rEHH  with default parameters to obtain absolute iHS scores for each variant position in each population and averaged iHS scores in sliding 25-kb windows with 12.5 kb step size. To calculate the CLR test statistic, we used the program SweeD v3.3.2 , applying a spacing of grid points of 12.5 kb and using the unfolded site-frequency spectrum. To prepare the input files, we used the phased genotype data described above and additionally determined the ancestral state for each SNP by comparing the alleles at each variant position with human and chimpanzee outgroup genotypes. We excluded sites that were not biallelic, for which the ancestral state could not be determined, or which were monomorphic at the population level. To identify significant departure from patterns expected under neutrality, we ran coalescent simulations under a detailed demographic model estimated earlier , generating 10,000 replicate sequences of 100 kb for comparison with the empirical data. For the MCM analyses, we retrieved gene ontology (GO) terms associated with the positively selected orangutan genes using the BioMart data mining tool from Ensembl v82 . We identified significantly enriched GO terms by computing the χ2 statistic for each GO term in a given set of positively selected genes per analysis against the set of all genes considered in that analysis, applying FDR multiple testing correction . For the iHS and SweeD analyses, we performed GO enrichment analyses using the R package “gProfileR” of the g:Profiler toolkit [93, 94]. Significance was assessed by comparing the candidate genes with a background list of all possible genes, i.e., all protein-coding genes (n = 12,866) located within any window with sufficient coverage for calculation of the iHS and CLR statistics. We applied the Benjamini-Hochberg method  for computing multiple testing correction for P values gained from GO enrichment analysis. Detailed methods and materials are provided in Additional file 1: Supplementary Information. We describe the interplay between environmental processes, demography, and adaptive evolution in a non-human great ape, the orangutan. We found that in the relatively stable environment of Sumatra, selection acted primarily on genes linked to brain development and learning, consistent with well-documented cognitive and cultural differences between species. On Borneo, however, selection manifested itself in physiological adaptations to harsher and more fluctuating environmental conditions. These findings may have important implications for the study of hominid evolution, as they suggest a link between cognitive and cultural evolution in great apes and the presence of high habitat productivity and demographic stability. Thus, our study provides a framework from which to develop and test more complex hypotheses about adaptive evolution in non-human great apes and to explore differences in adaptive evolution between our own species and our closest relatives. Maja P. Mattle-Greminger, Tugce Bilgin Sonay and Alexander Nater contributed equally to this work. We thank the following institutions for supporting our research: Sabah Wildlife Department, Indonesian State Ministry for Research and Technology, Indonesian Institute of Sciences, Leuser International Foundation, Taman National Gunung Leuser, and Borneo Orangutan Survival Foundation. Mario Barbato, Anna K. Lindholm, and Serge Wich provided comments on analyses and earlier drafts of this manuscript. This work was financially supported by University of Zurich Forschungskredit grants FK-10 (MPMG), FK-15-103 (AN), and FK-14-094 (TBS), Swiss National Science Foundation grants 3100A-116848 (MK, CvS) and P300PA_177852 (AN), Leakey Foundation (MPMG), UZH Research Priority Program “Evolution in Action” (MK), MINECO/FEDER UE BFU2017-86471-P (TMB), U01 MH106874 (TMB), Howard Hughes International Early Career (TMB), Obra Social “La Caixa” and Secretaria d’Universitats i Recerca and CERCA Programme del Departament d’Economia i Coneixement de la Generalitat de Catalunya (TMB), Julius–Klaus Foundation (MK), Ministerio de Economía y Competitividad grant BFU2013-43726-P (JB, MP), Gates Cambridge Trust (TD), A.H. Schultz Foundation grants (MK, MPMG), and the Department of Anthropology at the University of Zurich. The datasets supporting the conclusions of this article are included within the article and its additional files. Raw whole-genome sequencing data was obtained from three different sources, available in Sequence Read Archive under the following accession IDs: PRJNA189439 , PRJNA74653, and PRJNA20869 , as well as in European Nucleotide Archive: PRJEB19688 . Custom analysis scripts are available from GitHub https://github.com/alexnater/GB_D-18-00117  or from the zenodo research data repository https://doi.org/10.5281/zenodo.1435045 . MPMG, AN, TBS, and MK conceived the study and wrote the paper. MA also conceived the study. AS, JB, MA, MP, FC, TMB, and CPvS provided comments on the manuscript. MPMG, AN, TBS, MP, AS, JB, TD, GdV, FC, MA, and TMB carried out statistical analyses and contributed to the supplementary information. All authors read and approved the final manuscript. Nater A. Custom scripts used in “Genomes reveal marked differences in the adaptive evolution between orangutan species”. Github. https://github.com/alexnater/GB_D-18-00117. Nater A. Custom scripts used in “Genomes reveal marked differences in the adaptive evolution between orangutan species”. Zenodo. https://doi.org/10.5281/zenodo.1435045.